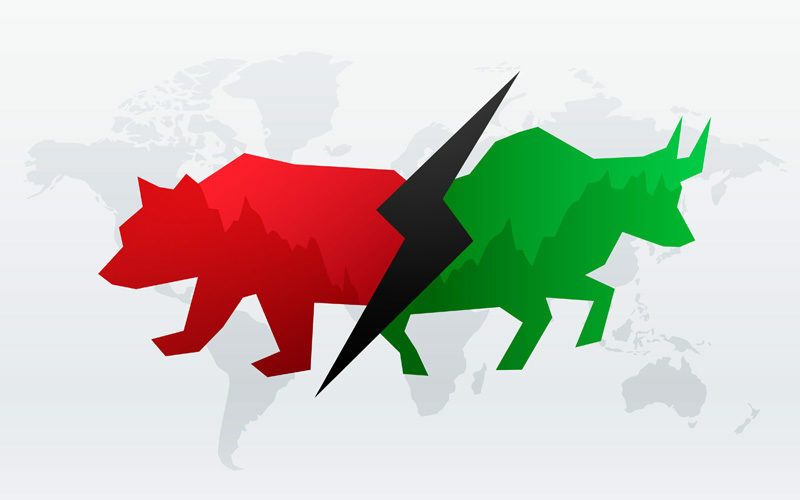 A very eventful week on the financial markets. On Monday, equities indexes likely hit their low point for this phase of the correction, with the S&P 500 bouncing over +6% from the Monday session low. In preparation for the mid-term elections next week, Trump announced that he wants to reach an agreement on trade with Chinese President Xi Jinping at the Group of 20 nations summit in Argentina later this month. Supposedly key U.S. officials have been asked to begin drafting potential terms. Obviously this is a ploy by Trump’s team to try to ensure equities rally into election day. 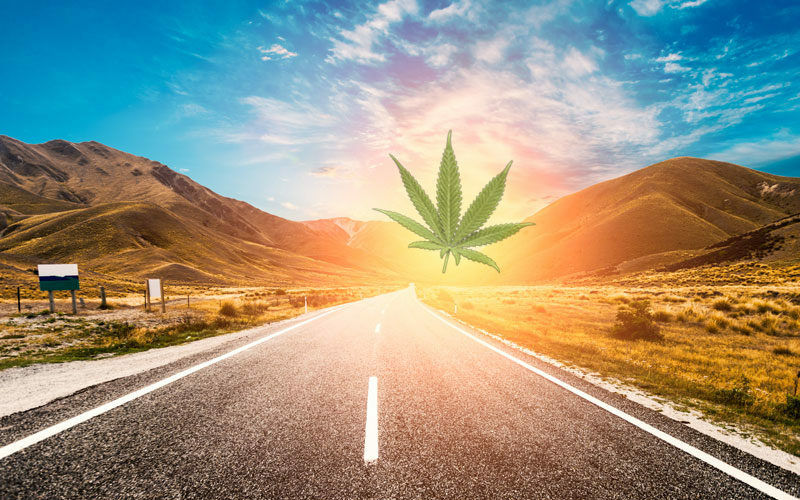 However as equity indexes were showing signs of bottoming early in the week, traders initially jumped on the Trump announcement, producing a rally which quickly faded. 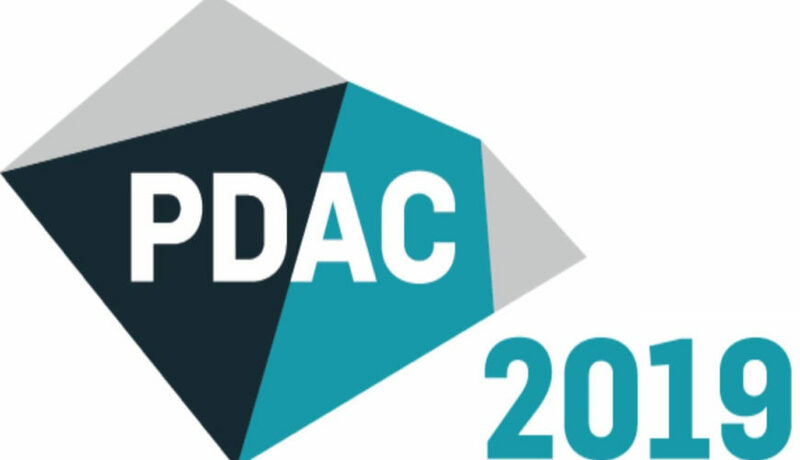 Macroeconomic data came in mostly strong this week, which leaves the Fed in a dilemma as to the pace of Fed rate hikes. The important ISM Manufacturing index eased to 57.7 in October, still a strong expansion but weaker than the 59.0 expected. A slowing ISM PMI, which tends to be coincident with the economy and lags only slightly the stock market, will be a good litmus test as to whether equity selling is justified (ie selling is in anticipation of recession). The October jobs report, on the other hand, boomed past expectations (250k job creations vs. 200k expected). The unemployment rate held at a cycle low 3.7%. Earnings continue to accelerate, rising +3.1% y/y in October. Durable goods orders and factory orders both picked up in September. As for price data, the closely watched Personal Consumption Expenditures index (PCE) came in at 2.0% y/y in September (along with +2.0% y/y for the core PCE). 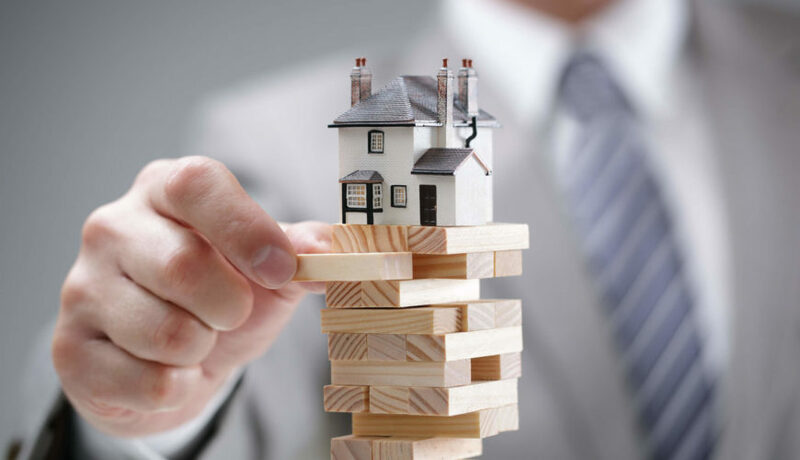 Overall, this week’s data should not result in a less hawkish tone at the next FOMC meeting….unless the Financial Market turbulence becomes a concern for the FOMC. 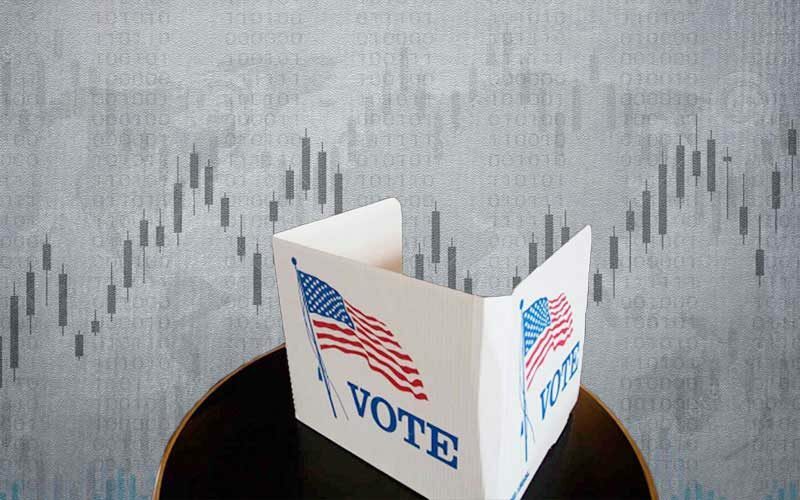 In this Commentary, we look at the seasonal trends for equities and bonds around a mid-term U.S. election under various scenarios. 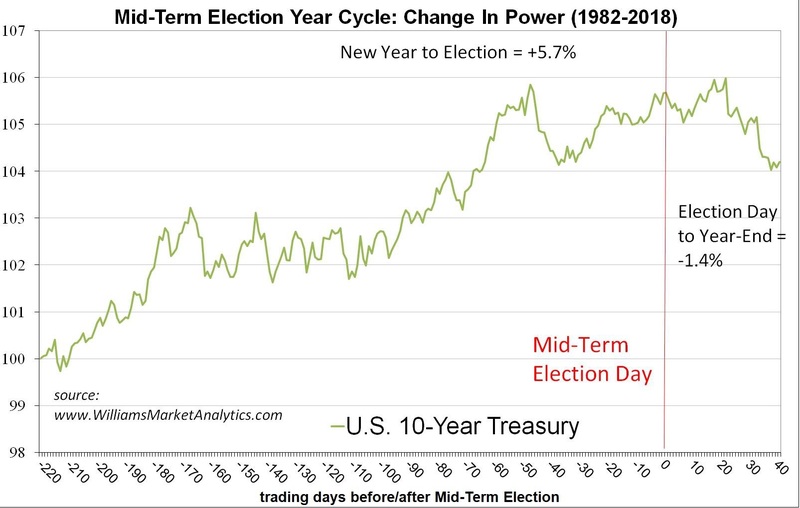 Our conclusion is that mid-term election years don’t tend to see strong year-end equity rallies under any scenario. The next big event for the markets will be the U.S. election. Many are betting that a year-end rally will begin following the November 6th elections. 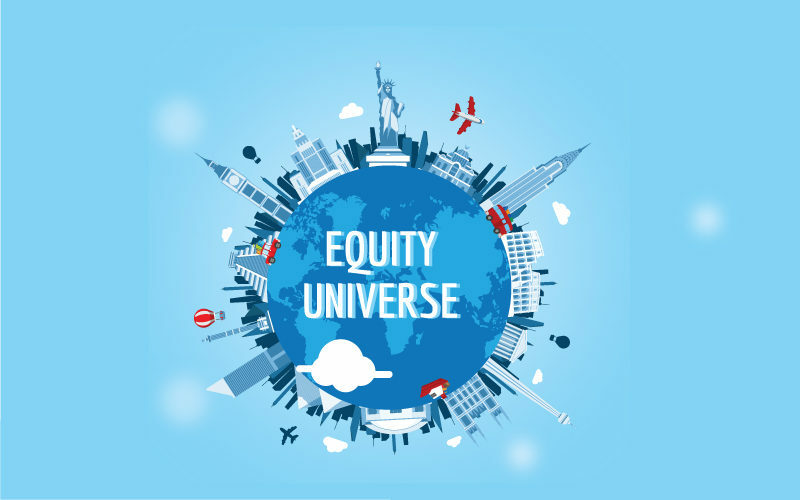 We have been hearing that most of the equity gains in a mid-term year occur late in the year. We decided to test out this claim. We have presented in the past our monthly performance break-down of the S&P 500 (re-produced below). 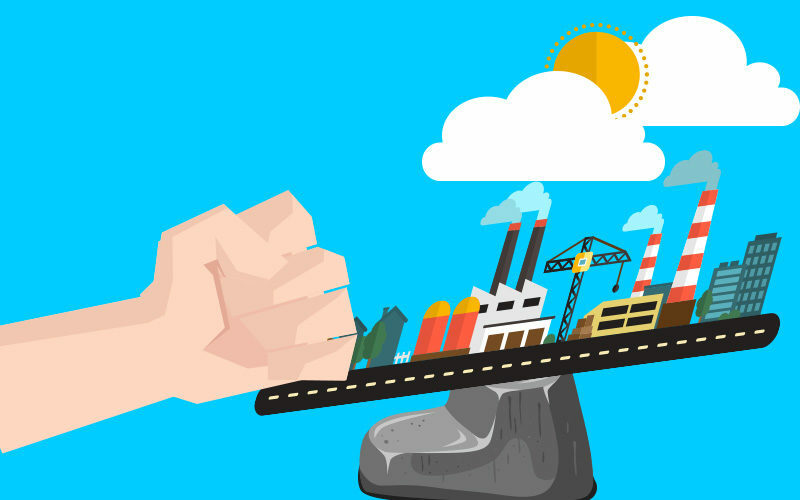 Typically the strongest gains of the year come in November and especially December. 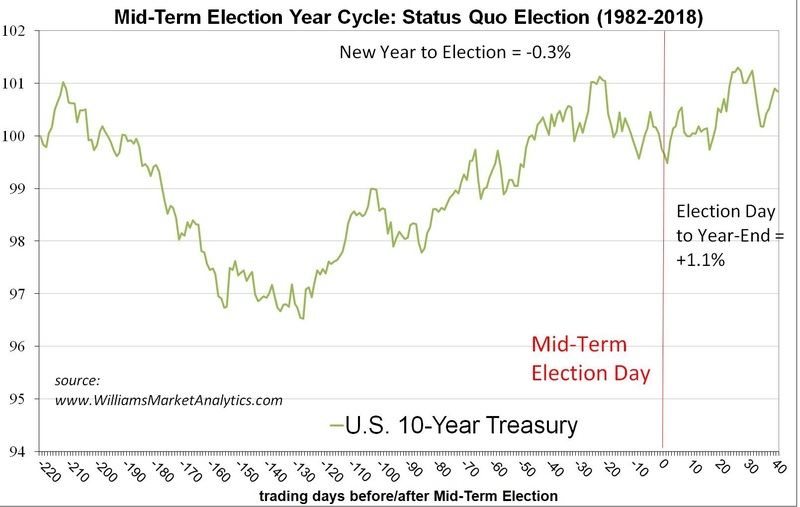 So does a mid-term election year offer investors more than this historical 3.0% (roughly) November/ December gain observed in all years? 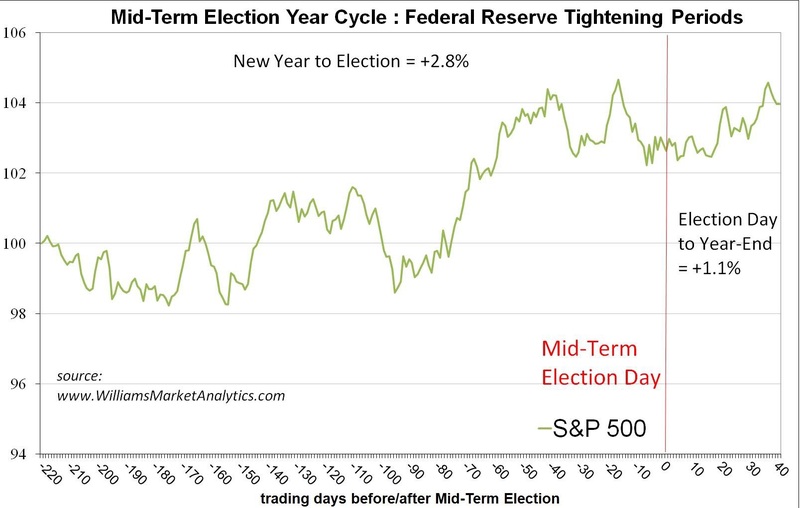 In addition to looking at all mid-term election years (part 1, below), we also considered mid-term election cycles during which the Federal Reserve is tightening/easing policy (part 2) and mid-term election cycles when there is a change in Congressional power (part 3). 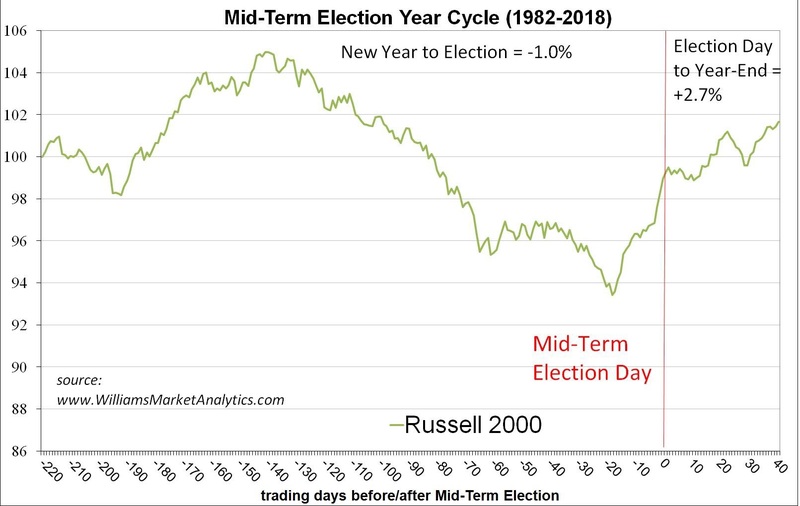 In sum, investors should not expect November/December returns above the historical norms shown above just because we are in a mid-term election year. The table below summarizes the direction of Federal Reserve policy and the change in Congress during mid-term election years. We highlight in red the years in which Washington saw a change in power. 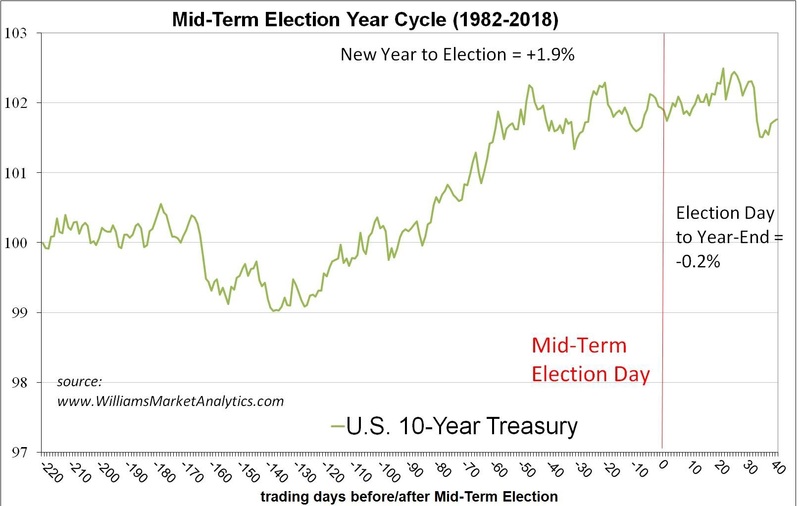 We begin by looking at market performance in all mid-term election years. The study considers U.S. blue chip stocks (S&P 500), U.S. cyclical small caps (Russell 2000), and safe-haven Treasurys (U.S. 10-Year T-Note). 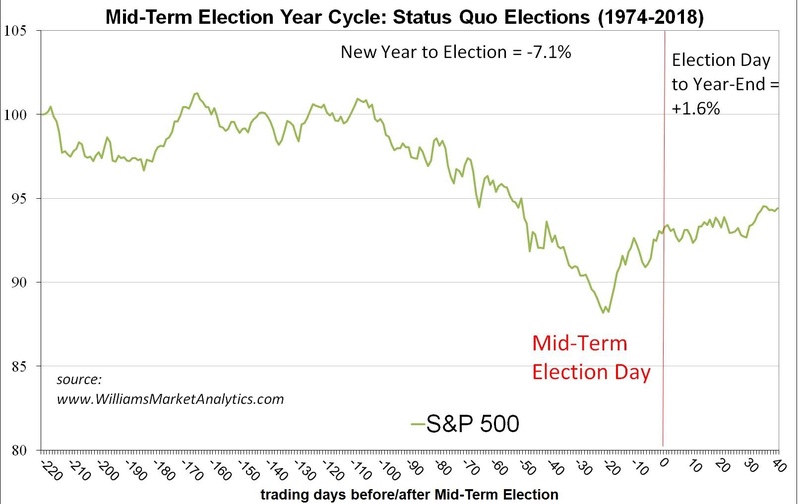 The historical mid-term election year path of the S&P 500 is shown below. The S&P 500 has tended to begin rallying about 20 days prior to the election and continuing into year-end. The +1.2% average post-election return is not too exciting. Finally Treasurys have tended to be flat at the end of mid-term election years. Next we looked at performance of the S&P 500, Russell 2000, and Treasury based on Fed policy direction. 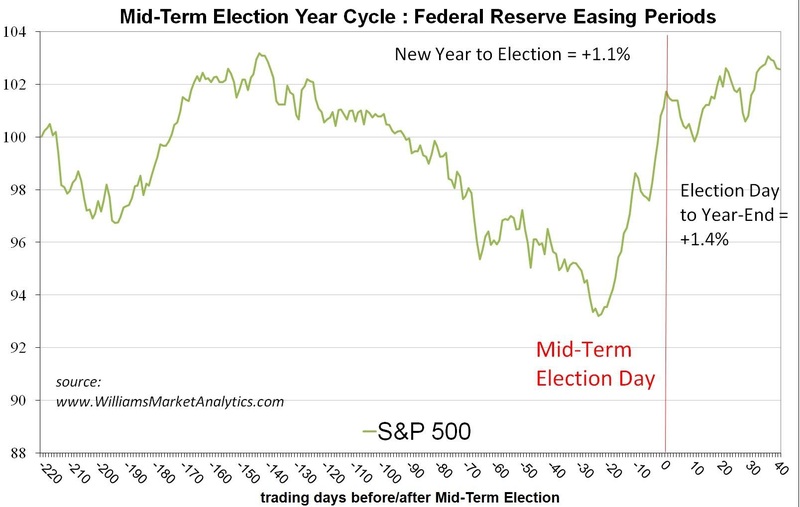 As we are currently in a Fed tightening cycle, we begin with the historical path of the S&P 500 during mid-term years when the Fed is tightening. Interestingly, we have seen a draw-down into the election, then a weak end-of-year bounce. Sort of like the 2018 path of the S&P 500 yesr-to-date. 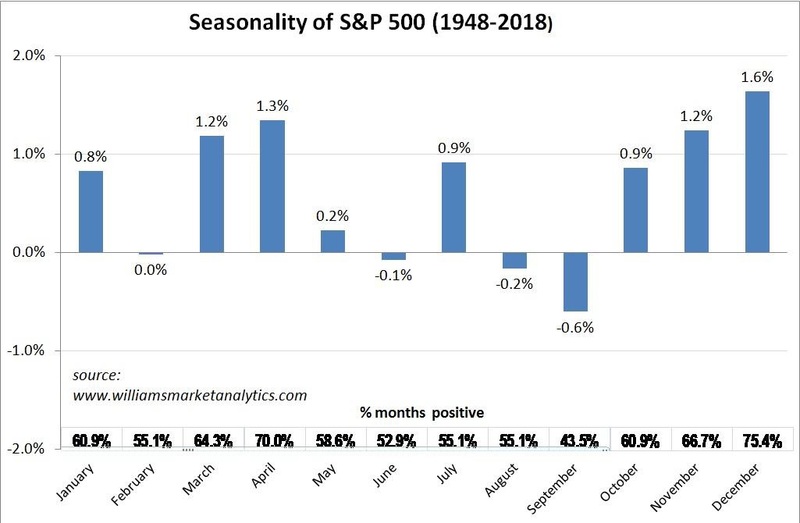 By comparison, the S&P 500 has produced small annual gains in years that the Fed is easing, with the typical weak seasonal period in Q3. The Russell 2000 performance in a Fed tightening cycle has again been weak relative to all periods. 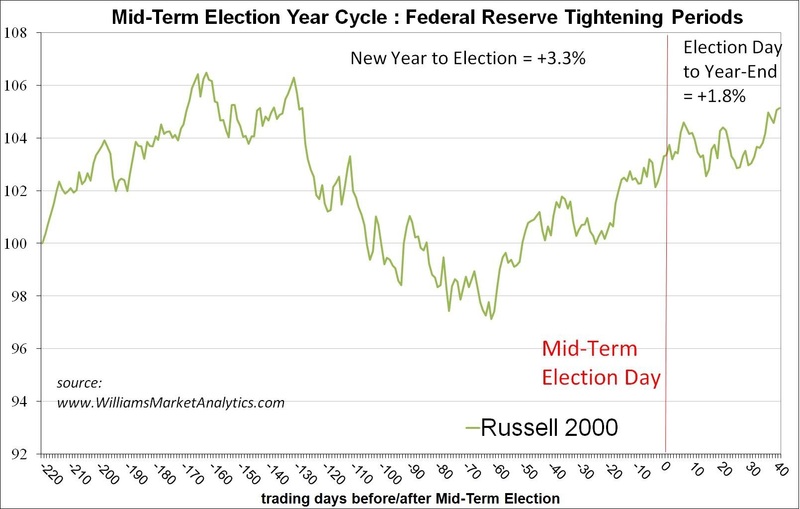 Unlike previous Fed tightening mid-term years, the 2018 Russell chart has not managed to rally into election day as in the past. Treasurys have again been lackluster following the election in Fed tightening periods. The results in Fed easing years hardly change. We have studied the Presidential Cycle in the past. Below we look at simply mid-term election years and the change in power in Congress. Assuming that Republicans hold on to both houses of Congress, the chart below traces the historical S&P 500 perform in these cases. 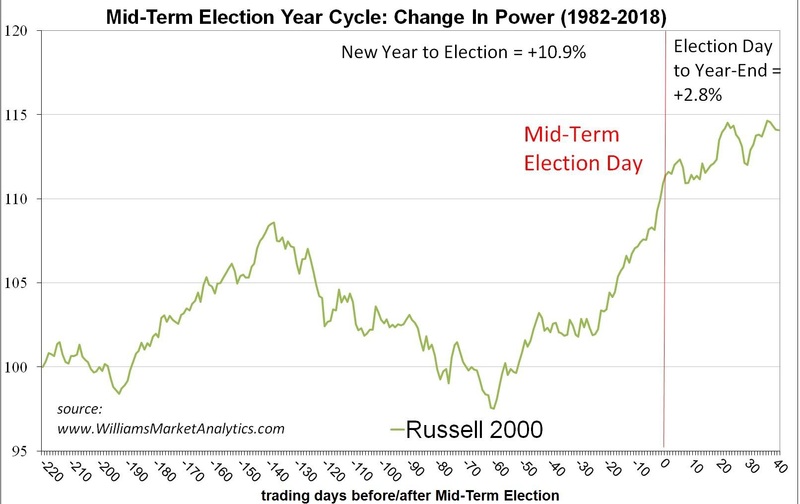 Unlike the prior cases, in which the index begins rallying prior to the election, this year we may hit election day at a stock market trough. Year-end gains should remain muted if Republicans hold on. 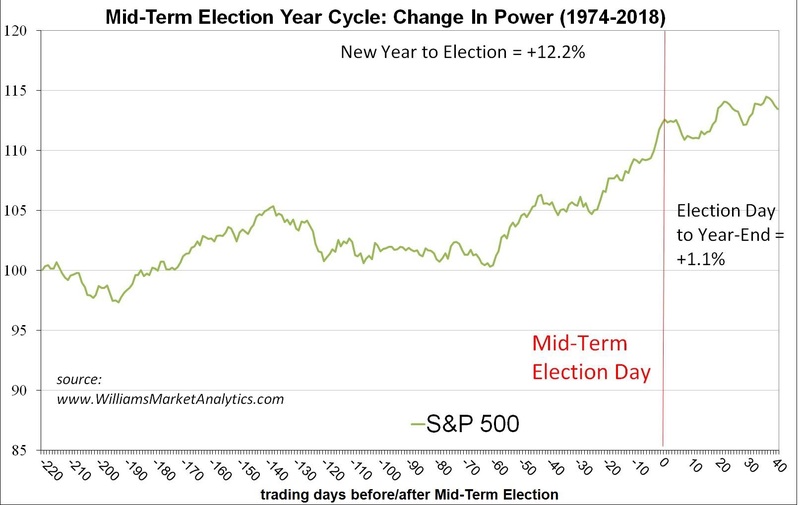 Even if Democrats gain control of one or both houses of Congress, historically the change in power does not boost S&P 500 end-of-year performance. 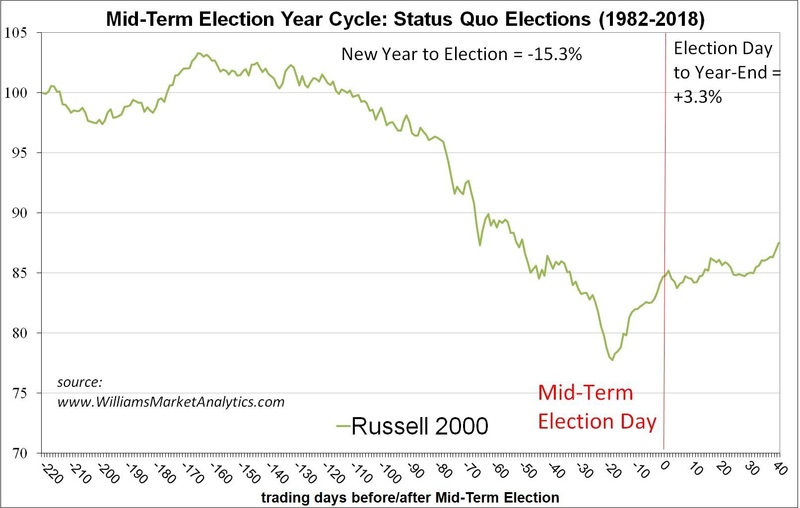 The Russell 2000 gives the same message regarding the election results: it doesn’t matter for stock performance. 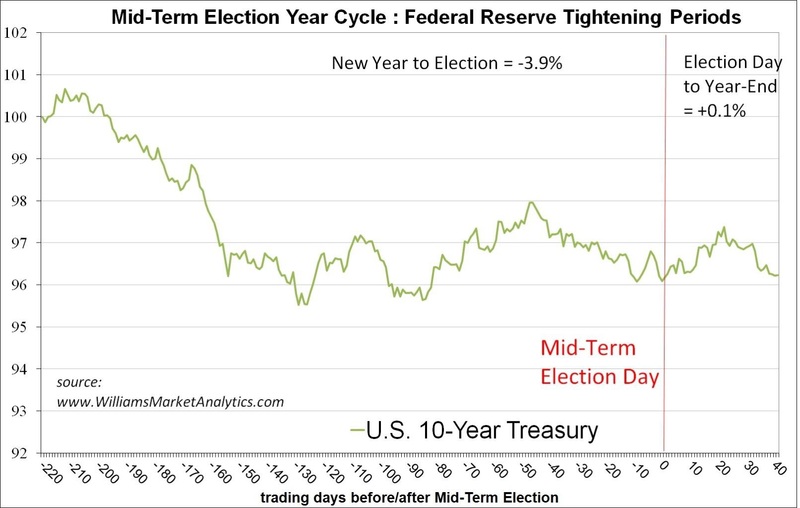 Finally, Treasurys tend to do significantly better at year-end when the mid-term election does not change the balance of power. Our guess is that the uncertainty of a new legislative agenda (taxes/spending) causes interest rates to rise. From our above charts, the 2018 paths of equities and bonds are not following the historical trends. In any case, we see no reason to buy equities in hopes of an out-sized post election bounce. In none of the cases studied have we seen exceptionally strong months of November and December in mid-term election years. What investors should be concerned about here is liquidity. Of course the Fed has been gradually removing liquidity from the markets. This has been telegraphed for some time. Near-term we are watching the end of the black-out period for share buy-backs, imposed on companies during earnings season (which essentially wraps up this week). If companies continue to forecast solid profits, share repurchases will likely surge as blackouts roll off, allowing companies to set a floor on the market should they opt to scoop up their own shares at these cheaper prices. About $110 billion of planned buybacks will be freed up in the week ending November 2, more than twice last week’s $50 billion, and that total will rise to $145 billion next week. 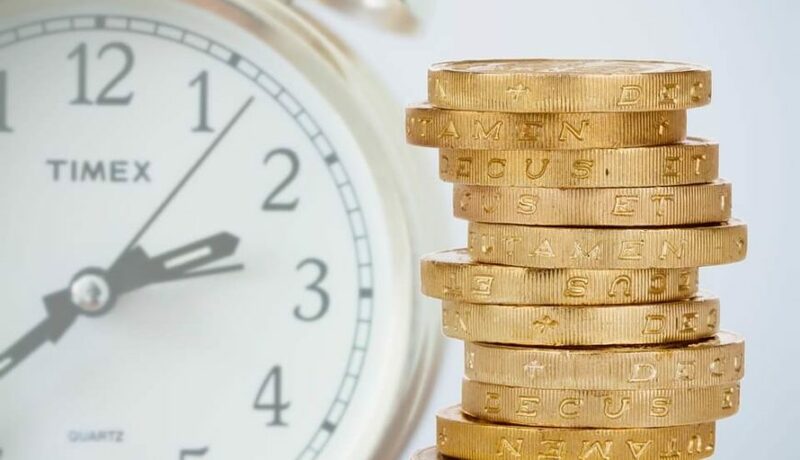 While it’s unlikely that all the money will be spent at once, big buyers will be present in the market once again. Barring economic weakness, we see no reason why companies would halt their buy-back programs here…especially if the Fed cools off their rate hike rhetoric. 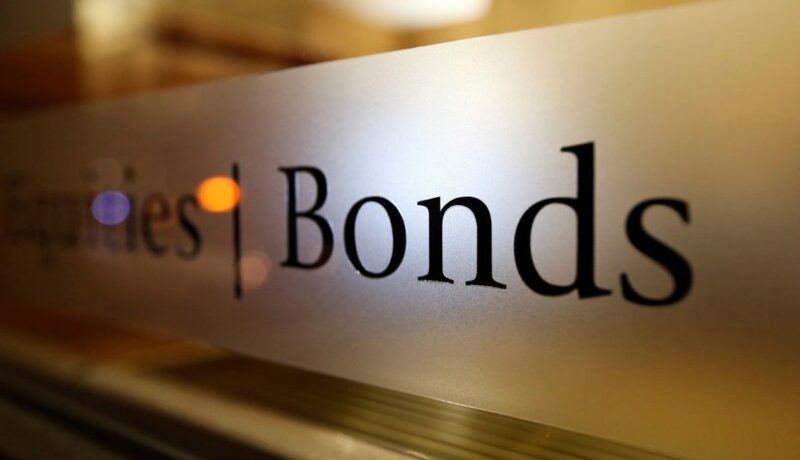 In our opinion, if we are going to see a year-end rally, it will have to be driven by corporate buy-backs as investor sentiment has soured significantly. The plunge in the WMA Sentiment Indicator (below last February lows) suggests that skittish investors will only be buying on price strength going forward. Betting on a year-end rally after an October correction may make sense, provided that the correction is not signaling greater problems for the economic expansion. However we would not be making a bullish bet on a year-end rally in equities because of the mid-term election year. The hopes of see corporate buy-backs return will be the likely source of a potential year-end rally this election year that could break the back of this negative investor sentiment. This week we deployed some cash in our DGR to take a sector-neutral position in the MSCI All World Index (Vanguard Total World, ticker VT) for a 17.5% weighting. We got in near the lows, completing the position on Monday. Our goal is simply to cash-in on our successful month of missing the market correction by riding up global equities, at least partially. We will continue to bet heavily on a 2-way market going forward, meaning selling into strength (when investors are getting optimistic) and patiently buying on price weakness (when investors fear the popping of the bubble). Note that we will continue to announce in our Daily Updates when we open or close our Trade Recommendations of the Week.